Join the Fleet Feet Crew and Running For Brews at the Graffiti Junktion Wednesday, June 3rd at 7PM for a 3 Mile or More Run. Drew from Superfeet will be there with Demo pair and some raffles! Chris Trinidad: I enjoy the sense of achievement and the extra energy boost I have afterwards. Kelley Leonard: I run for me. I run because running has always been there for me through good times and bad. Kayla Keyser Nylander: I run to be a better version of myself. Running brings out the best in me. Ashley Meyers: Running is my escape. I have some of my best ideas when I am running. I am more creative, down to earth and it helps me create a balance in my life. Jim Reed: I run to remain healthy and show others you're never too old! Allyson Foss: I run because it reminds me how amazing the human body is. It's humbling. Running has gotten me through the toughest parts of my life. "You can run 50 miles, in the summer, in Florida...you can get through (insert situation)"
Jessica Crofoot: I run because it keeps me strong mentally and physically. I love to run on my own to decompress or with friends to catch up. Running keeps me sane. 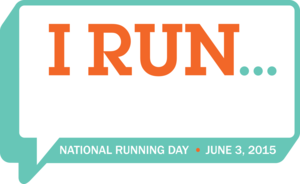 I run because it keeps me competitive not only with myself, but with others too. Korene Hinds: I sleep, breath, eat and talk running. But the real reasons why I run it make me happy, it gives me a peace of mind and also to inspire others. I love it. Christopher Scott: I run so I can enjoy bacon...and Chinese... And tacos... Food in general really. I run because it's a challenge, I don't always love my run. But when I finish I know I'm stronger and that's what keeps me going back for more. Jen Yoon-Yang: I run away from stress and worries, it helps me focus and keep things on track. Keeps me sane. Lauren LaRoche: At this point it's as much a part of my identity as anything. I'm not saying I love running all the time or that it's always fun or easy, because it's not. But not running is always worse. Brendan Mertz To get away from everything and clear my mind and to push myself past limits others impose on themselves. Elizabeth Piperno: I don't have a specific reason, it's just a part of who I am. Running makes me feel like a little kid!